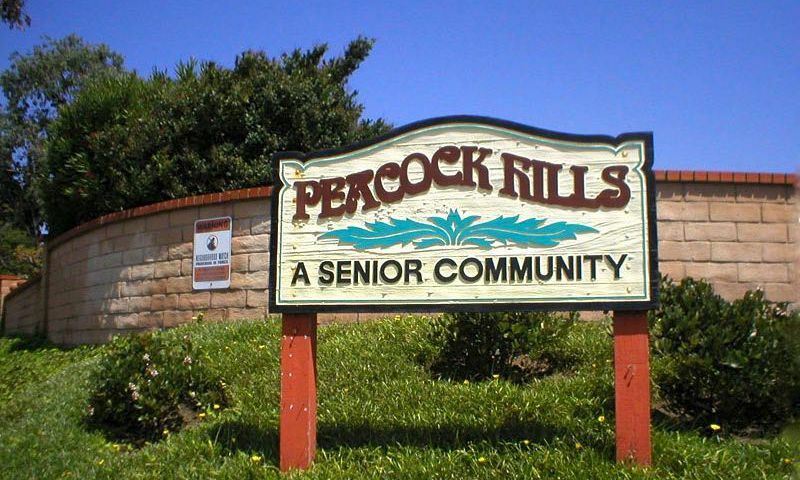 Peacock Hills is a 55+ community located in Oceanside, California. This well-established community is just minutes from the Pacific Coast, shopping and downtown San Diego, making it in one of the most desirable locations in Southern California. With 920 single-family homes situated in a beautiful neighborhood, Peacock Hills has the home varieties and picturesque surroundings to please active adult homebuyers in Oceanside, California. Peacock Hills offers residents a beautiful community to enjoy morning walks, allowing ample opportunity to enjoy the beautiful Southern California climate. Although there is no clubhouse, residents often feel a close sense of community and often socialize in each others' homes or catch up while enjoying the neighborhood's beautiful landscape. Residents within Peacock Hills also have access to the El Corazon Senior Center less than four miles away. The El Corazon Senior Center offers over 27,000 square feet of interior space exclusively for adults aged 55 and better. Inside, residents will find a classroom, meeting rooms, and a catering kitchen with a dining room. The 900 square-foot fitness room is available to residents for a reasonable monthly fee and features cardiovascular and weight-training equipment. Peacock Hills was built between 1976 and 1980 and consists of 920 attached homes. All residences are arranged in duplex buildings and offer approximately 830 to over 1,300 square feet of living space. Most homes feature two or three bedrooms, two bathrooms, and an attached one-car garage. Some homes offer a den perfectly suitable for a home office. Peacock Hills was built with the active adult in mind, providing residents with beautiful, low-maintenance yards, single-story living, and patio spaces. Residents within Peacock Hills enjoy living in a tight-knit community where neighbors become lifelong friends. The community regularly has social events like brunches, happy hours, and coffee meetings. Meet new neighbors over games of bridge, explore a new hobby with the needlecraft group, or get in shape with the walking group. Living in Peacock Hills means enjoying the company of neighbors and friends. Peacock Hills is located in Oceanside, California. The community is located just seven miles from the beaches in Oceanside. Just down the street is the Plaza Rancho Del Oro that has an Albertson's, Planet Fitness, and several restaurants in the immediate area. Golf enthusiasts will love that the Emerald Isle Golf Course is just five miles down the street while the El Camino Country Club, the Oceanside Golf Course, and several other courses are within driving distance from Peacock Hills. Residents enjoy easy access to Routes 76 and 78 that connect with Interstate 15. The Scripps Coastal Medical Center is less than four miles away. With all of this nearby, Peacock Hills is one of the most convenient active adult communities in Oceanside, California. Peacock Hills has walking paths for residents to enjoy the beautiful neighborhood. The El Corazon Senior Center is just down the street from Peacock Hills. Although most services are free, access to the fitness center and some events require a fee. It is located at 3302 Senior Center Drive. El Corazon Senior Center - 27,000 Sq. Ft. There are plenty of activities available in Peacock Hills. Here is a sample of some of the clubs, activities and classes offered here. Peacock Hills was built between 1976 and 1980 and consists of 920 attached homes. All residences are arranged in duplex buildings and offer approximately 830 to over 1,300 square feet of living space. Most homes feature two or three bedrooms, two bathrooms, and an attached one-car garage. Some homes offer a den perfectly suitable for a home office. Peacock Hills was built with the active adult in mind, providing residents with beautiful, low-maintenance yards, single-story living, and patio spaces. Please Note: Floor plans are not available at this time. 55places.com is not affiliated with the developer(s) or homeowners association of Peacock Hills. The information you submit is distributed to a 55places.com Partner Agent, who is a licensed real estate agent. The information regarding Peacock Hills has not been verified or approved by the developer or homeowners association. Please verify all information prior to purchasing. 55places.com is not responsible for any errors regarding the information displayed on this website.